A call to RJC Yachts elicits good news...they have sold the 37m motor yacht Phaedra. Delivered by Delta Marine in 1997, she was re-engined in 1999 with twin V2000 MTU power plants and was repainted in 2007 along with a new interior. Phaedra has a four stateroom layout for eight guests plus five crew, with a comfortable main salon, dining area, spacious aft deck and skylounge. Powered by Detroit/MTU 16V-2000s with 10,000 gallon of fuel provides extended range. She was on the market asking $7.495 million. 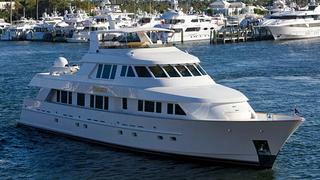 Bob Cury of RJC Yachts represented the seller as central agent, and Burgess represented the buyer. Phaedra and will be renamed Time For Us.